#ICYMI, I did an interview with fellow self-published author, David Ramos recently. David is extraordinarily talented at building a platform and has the scars to prove it. You can find the full audio on Podbean, but it’s also on YouTube (for all you visual peeps out there). Welcome to the Rise of Digital Voices! In case you didn’t already know, the Internet is FILLED with competing messages. Thanks to the onset of social media platforms, more people than ever have the ability to share their unique voice with the rest of the world. And in doing so, can create online communities where similar minds (and interests) can congregate. To share ideas. To share insights. To share individual stories. This is the Age of Digital Voices – a time when the gatekeepers of information have been usurped by the end user. 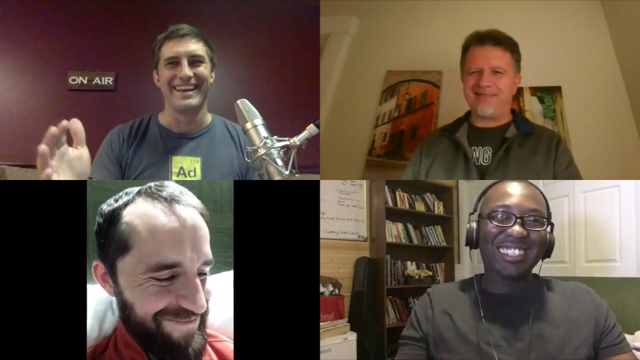 In this very special episode of The Writer’s Lens, I sit down with three other creative voices: Brian Del Turco of Jesus Smart: The Podcast and owner/operator of LifeVoiceQuest; Willie Scott co-founder of Better Than Blended and TKI Publishing; and Brent Mclaughlin, aspiring writer. These three gentlemen make up our Cleveland creative group otherwise known as the “Pens of Steel” and for the first time, we are recording our conversation concerning this growing phenomenon of the social media landscape. This will be the first of a three-part discussion on the topic so stay tuned for more to follow in the coming weeks. What does it do for us when we finish what we start? If you’re the type of person that struggles with unfinished projects, then maybe you are in need of a morale boost. Or a gentle reminder of what you feel strongly about. Something to kick-start the juices and make it to the finish line. Or perhaps on an even deeper level, maybe your unique message just isn’t clear yet. In my case, finishing a book is what I aim to do. Not an easy task; not something one does in a weekend. For writing a book can feel like running a marathon. But here’s something to remember: we aren’t alone in our pursuits. In this episode, I talk in depth about the things we can learn about ourselves as we work through our passion projects. And how there’s a unique voice each of us can cultivate by bringing that message to completion. As the picture suggests, a FREE author conference is coming up in Cleveland. And I’ll be fortunate enough to be there. Not just as a spectator, but as an author with a table full of goodies. This is not the first “author event” I’ve been to though. A couple years ago, I was at Mount Union University for a similar function. Designed for alumni – that’s me – I got to have my own table, surrounded by other alumni with published works of their own. It was a good experience and I was happy to be a part. However, I won’t be on “home soil” this time around. This is a public event and full of folks that have probably never heard of me before. But hey, I’m willing to try and change that. You never know who you’ll meet or what you’ll encounter. And that’s exciting in its own right. 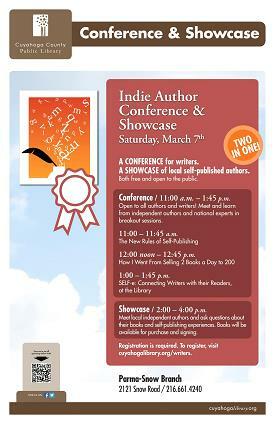 The Cuyahoga County Public Library showcase starts at 11 am and ends at 4 pm, Saturday, March 7.